As much as we love the fabulous forced florals of the season, this year why not gift a plant that looks pretty, fresh, and lush now and through the cold months? Depending on your zone, these five picks can go into the garden in spring and thrive for years to come. While not technically “houseplants,” they are easy to grow if given a bit of attention to watering and light needs. Pot up into a decorative container and add some twirly ribbons and a card with care information for later (below). In the depths of January, the lucky recipients will still be thanking you. 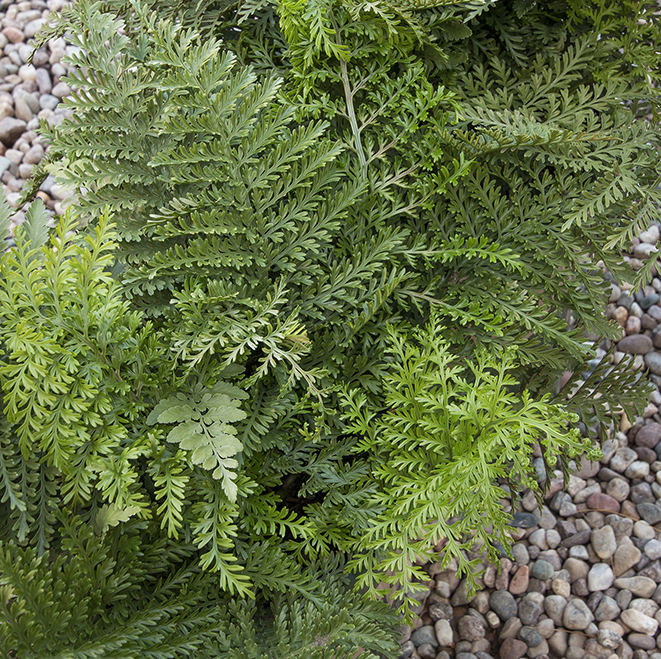 A new, unique fern with thick and glossy dark-green foliage held on strong, feathery fronds. Durable, handsome, and highly adaptable to low humidity, this sterile variety does not develop messy spores, making it ideal houseplant in any climate. NOW: Plant solo or mix with bush lily or gardenia in an indoor container garden; add the glossy, green fronds to cut flower arrangements. Prefers bright, indirect light. LATER: Plant in a wooded garden or shady bed. Mix with other shade loving perennials and flowering shrubs like camellia, azalea, hydrangea, coral bells, hosta and astilbe. Clusters of fragrant, pure white, tubular flowers on long twining stems contrast nicely with the dark green, leathery leaves. NOW: Place in a cool window with plenty of bright light where you can enjoy the intoxicating fragrance. Water only when top inch of soil is dry. LATER: An excellent container plant, this elegant beauty will twine up a trellis, arbor or fence with support in sheltered gardens and courtyards. Ideal with other tropical looking plants with more bold coloration such as Bird of Paradise, Golden Dust hibiscus, and Little Becca flax lily. 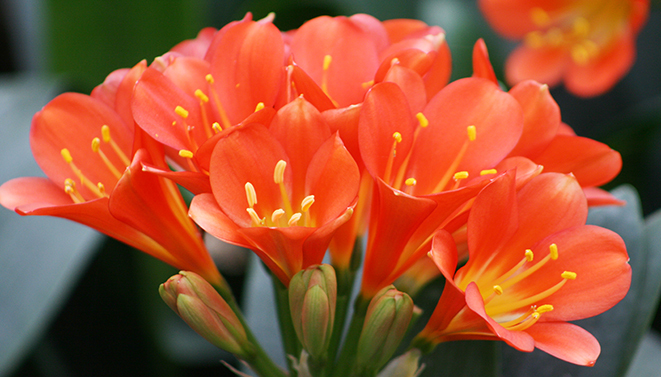 A rugged houseplant that demands little attention, Kaffir lily is a reliable bloomer sending up brilliant orange or creamy white flowers in spring. NOW: Rounded clusters of up to sixty flowers on tall stems in late winter or early spring make this an absolutely gorgeous container specimen. Place in a warm, sunny window and water when the top inch of soil is dry. LATER: In warmer zones plant in a shady location where they add zippy color even in dry shade situations. Create a cool, tropical shade garden when combined with elephant ears, Tasmanian tree fern, flax lily, violas, and fuchsia. In colder zones, bring potted plant outdoors when night temps are stable in the 60s and indoors again before the first frost. A petite aloe with festive color! 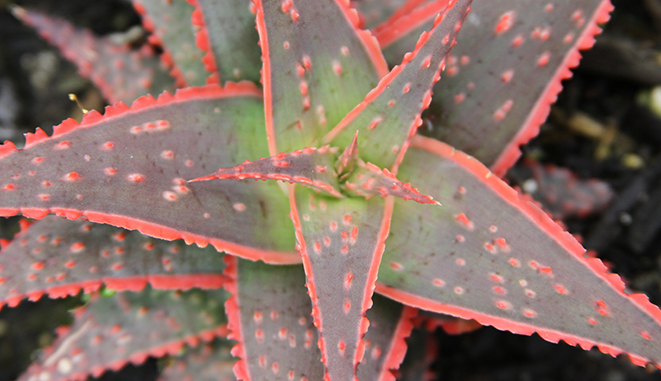 Dark green succulent leaves feature deep crimson raised spots and are trimmed in bright red. Vibrant pink to reddish-orange flowers from fall into winter add to the show. NOW: Super easy and unfussy; place in a sunny window where they receive bright, direct sunlight, such as a south- or west-facing window. Water only when the soil has dried out completely. LATER: This water-wise plant is a great selection for use in rock gardens, as a small-scale groundcover, or in containers. May tolerate colder temperatures with winter protection when established, or bring indoors before frost in colder zones. Year round outdoors in warmer zones. 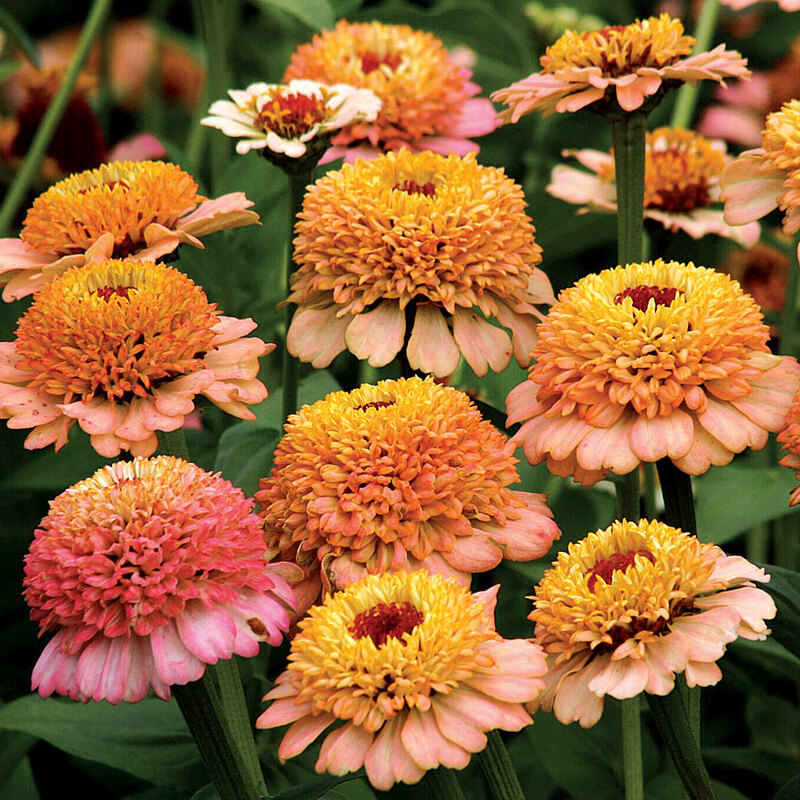 Will produce deepest colors if placed in full, direct sun. Goshiki translates from Japanese as "five colors" and its variegated leaves swirled in pink, green, gold, yellow, and ivory bring weeks of fresh, bright color to any room. The tiny white flowers are extremely fragrant, hidden amongst the leaves, and bloom in late fall once the plant has matured. Such an unexpected, but awesome gift. NOW: It's an easy keeper given a bright location in a cool room. Turn twice a week to ensure all sides receive sunlight. LATER: In warmer zones, false holly may be planted outdoors in spring in a container, woodland garden or as a low hedge. 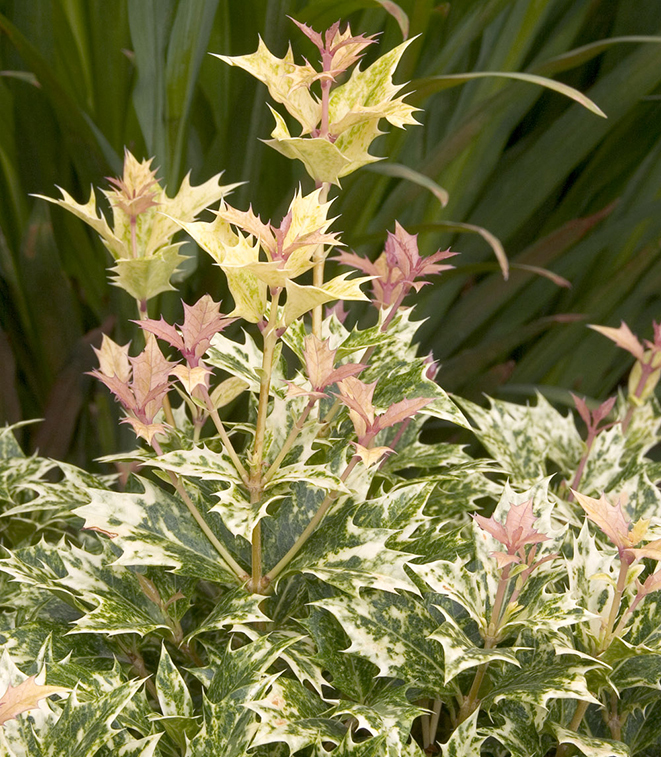 Plant with gold leaf or other Asian inspired plants like nandina, peony, and Asiatic lilies. In colder zones, move outside once evening temps are in the 50s and bring indoors before frost.